Cassio, the brand spankin’ new LKF Tower restaurant and bar, is the latest in the stable of Gilbert Yeung, he of Dragon-i and Tazmania Ballroom fame. And no expense seems to have been spared with the plush and dramatic 60s-inspired room that opens out to one of the more impressive terrace spaces that we’ve seen in Hong Kong, laden with live greenery. Yet the money seems to have unfortunately stopped when it comes to stocking the bar, which is home only to the usual suspects, bottom-heavy as far as top shelf goes. The menu, though, designed by chic London tapas bar Barrafina, does make use of good ingredients and clever touches. It doesn’t always achieve great heights, however. The prawn croquetas ($68) are generous in size and filled with a creamy prawn and lobster bisque but aren’t as crispy and as golden as we’d like. The iberico sobrassada tortilla ($98) is filled with a delicious semi-soft iberico chorizo spread but the potato casing is a little bland. The tuna tartare ($188) fares much better, an umami-laden dish of fish on a creamy avocado base, topped with mushroom and ginger flower. 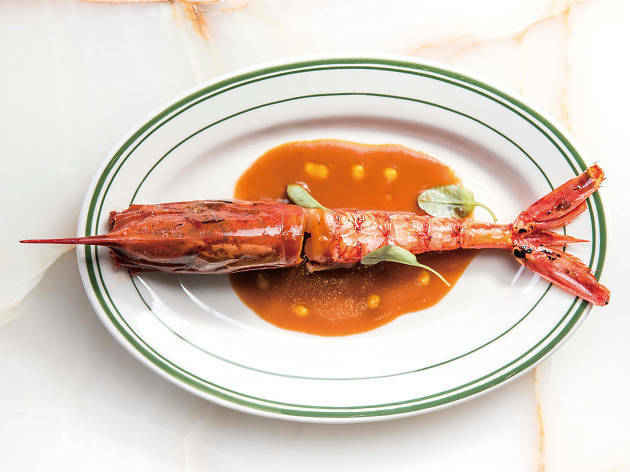 We also enjoy the signature carabinero ($248), a large shell-less torched red Spanish prawn placed on a lovely seafood bisque which is rich and satisfying. Our dessert of churros ($98 for three) falls a little short, though. The finger-sized doughnuts aren’t cooked through enough and the chocolate crumble needs more flavour.